This pattern is based on my Quickie Caplet pattern. As with that one, it holds multiple yarns together and uses big needles to make it a quick, fun knit. The one pictured above is the Long length. All versions have three “furry” rows, but in the medium length version, they are narrower and the collar is slightly shorter. Why Dr. Seuss? Well, you can dress it up a bit by bunching it up over a frock and you might resemble Seuss’s character Foona-Lagoona Baboona. If you wear it poncho style over casual clothes or a jacket you’ll fall somewhere between the Dr. Seuss birds the Goo-Goo Goose or a Pelf. Needles: a 32” circular needle–size 17. Fuzzy rounds are created by holding one strand of Fur Sure together with one strand of Super Saver. Plain rounds are created by hold two strands of the Super Saver alone. Cast on 72 (88) stitches holding one strand fur yarn and one strand worsted plain yarn together. Join yarn to knit in the round, placing a marker. Continue in the round using a K2P2 rib (all fuzzy rows are ribbed) for 6 (8) rows. Decrease one stitch at marker each row (on fuzzy rows only) to hide reductions. Row 7 (9) drop Fur Sure and pick up another strand of smooth yarn (two smooth yarn strands held together. Knit in stockinette for 6 (8) more rounds even (do not decrease on smooth/stockinette rows to hide decreases). Row 13 (17) drop one strand of smooth yarn and pick up the furry strand. Rib for 6 (8 rows). Decrease one stitch at the marker each row. Row 19 (25) Drop furry yarn and holding two smooth yarns together knit in K2P2 rib for 10 (14 rows). Do not reduce. © Kristin Tolle. 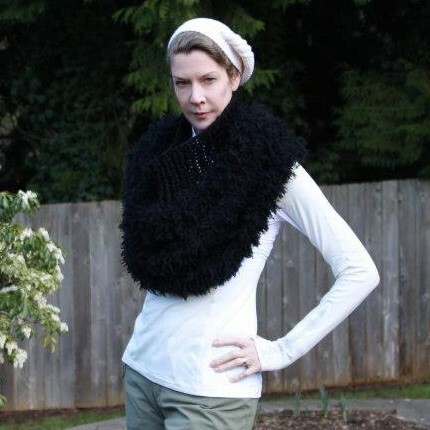 This pattern is freely available and without restriction to all would be capelet makers and Dr. Seuss lovers! Next > How Many Times Do I Have to Knit THIS Sock? The Pelf! I used to wrap anything fluffy or fuzzy around myself and pretend I was a Dr. Seuss character. 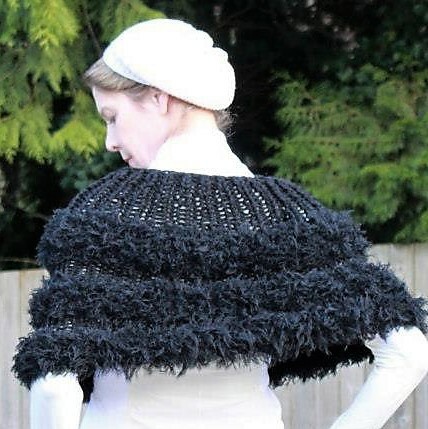 Your capelet is perfect for that, and fabulous! I have a couple of small nieces who might desperately need one.